"Columbia River from Walla Walla to Vancouver"
The road continued along the river, and in the course of the day Mount St. Helens, another snowy peak of the Cascade range, was visible [most likely Mount Adams], another snowy peak of the Cascade range, was visible. We crossed the Umatilah river [Umatilla River] at a fall near its mouth. This stream is of the same class as the Walahwalah river [Walla Walla River], with a bed of volcanic rock, in places split into fissures. Our encampment was similar to that of yesterday; there was very little grass, and no wood. By observation, our camp is in latitude 45° 50' 05", and longitude 119° 22' 18". We continued to travel along the river, the stream being interspersed with many sand-bars (it being the season of low water) and with many isalnds, and an apparently good navigation. Small willows were the only wood; rock and sand the prominent geological feature. The rock of this section is a very compact and tough basalt, occurring in strata which have the appearance of being broken into fragments, assuming the form of columnar hills, and appearing always in escarpments, with the broken fragments strewed at the base and over the adjoining country. We made a late encampment on the river, ... Latitude 45° 44' 23", longitude 119° 45' 09". Mount Hood is glowing in the sunlight this morning, and the air is pleasant, with a temperature of 38°. We continued down the river, and, passing through a pretty green valley, bounded by high precipitous rocks, encamped at the lower end. The road in about half an hour passed near an elevated point, from which we overlooked the valley of the Columbia for many miels, and saw in the distance several houses surrounded by fields, which a chief, who had accompanied us from the village, pointed out to us as the Methodist missionary station. 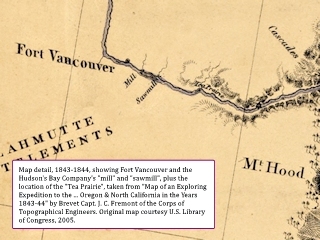 In a few miles we descended to the river [Columbia River], which we reached at one of its remarkably interesting features, known as the Dalles of the Columbia [the rapids at The Dalles, Oregon]. The whole volume of the river at this place passed between the walls of a chasm, which has the appearance of having been rent through the basaltic strata, which form the valley of rock of the region. At the narrowest place we found the breadth, by measurement, 58 yards, and the average height of the walls above the water 25 feet; forming a trough between the rocks --- whence the name, probably applied by a Canadian voyageur. The mass of water, in the present low state of the river, passed swiftly between, deep and black, and curled into many small whirlpools and counter currents, but unbroken by foam, and so still that scarcely the sound of a ripple was heard. The rock, for a considerable distance from the river, was worn over a large portion of its surface into circular holes and well-like cavities, by the abrasion of the river, which, at the season of high waters, is spread out over the adjoining bottoms. In the recent passage through this chasm, an unfortunate event had occured to Mr. Applegate's party, in the loss of one of their boats, which had been carried under water in the midst of the Dalles, and two of Mr. Applegate's children and one man drowned. This misfortune was attributed only to want of skill in the steersman, as at this season there is no impediment to navigation; although the place is entirely impassable at high water, when boats pass safely over the great falls above, in the submerged state in which they then find themselves. The last of the emigrants had just left the Dalles at the time of our arrival, traveling some by water and others by land, making ark-like rafts, on which they had embarked their families and households, with their large wagons and other furniture, while their stock were driven along the shore. For about five miles below the Dalles, the river is narrow, and probably very deep; but during this distance it is somewhat open, with grassy bottoms on the left. Entering, then, among the lower mountains of the Cascade range, it assumes a general character, and high and steep rocky hills shut it in on either side, rising abruptly in places to the height of 1,500 feet above the water, and gradually acquiring a more mountainous character as the river approaches the Cascades. Being now upon the ground explored by the South Sea expedition under Captain Wilkes, and having accomplished the object of uniting my survey with his, and thus presenting a connected exploration from the Mississippi to the Pacific, and the winter being at hand, I deemed it necessary to economize time by voyaging in the night, as is customary here, to avoid the high winds, which rise with the morning and decline with the day. Accordingly, after an hour's halt, we again embarked, and resumed our pleasant voyage down the river. ... About midnight we put to the shore on a rocky beach, behind which was a dark-looking pine forest. We built up large fires among the rocks, which were in large massess round about; and, arranging our blankets on the most sheltered places we could find, passed a delightful night. After an early breakfast, at daylight we resumed our journey, the weather being clear and beautiful, and the river smooth and still. On either side the mountains are all pine-timbered, rocky, and high. We were now approaching one of the marked features of the lower Columbia, where the river forms a great cascade, with a series of rapids, in breaking throught he range of mountains to which the lofty peaks of Mount Hood [Mount Hood, Oregon] and St. Helens [Mount St. Helens, Washington belong, and which rise as great pillars of snow on either side of the passage [Cascade Rapids]. The main branch of the Sacramento river, and the Tlamath, issue in cascades from this range; and the Columbia, breaking through it in a succesesion of cascades, gives the idea of cascades to the whole range; and hence the name of the CASCADE RANGE, which it bears, and distinguishes it from the Coast Range lower down. In making a short turn to the south, the river forms the cascades in breaking over a point of agglomerated masses of rock, leaving a handsome bay to the right, with several rocky pine-covered islands, and the mountains sweep at a distance around a cove where several small streams enter the bay. In less than an hour we halted on the left bank, about five minutes' walk above the cascades, where there were several Indian huts, and where our guides signified it was customary to hire Indians to assist in making the portage. 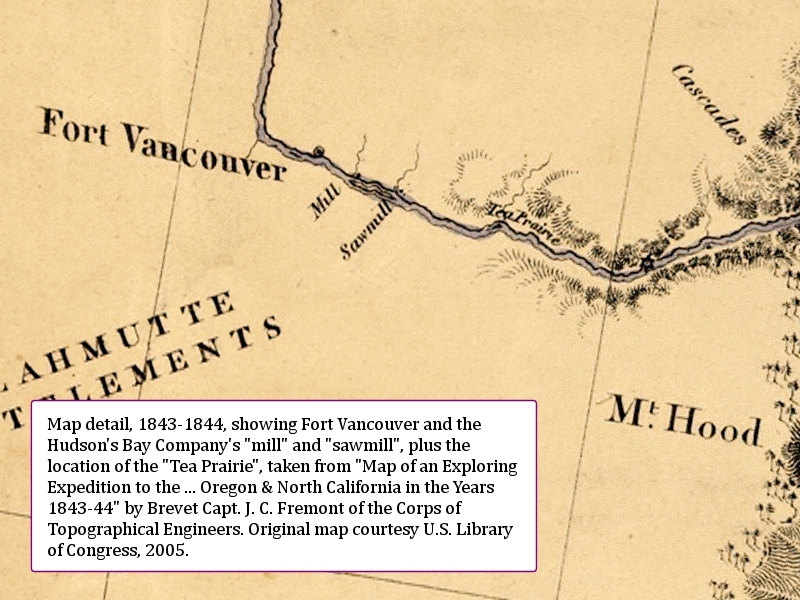 ... On a low broad point on the right bank of the river, at the lower end of these rapids, were pitched many tents of the emigrants, who were waiting here for their friends from above, or for boats and provisions which were expected from Vancouver [Fort Vancouver, Washington]. In our passage down the rapids, I had noticed their camps along the shore, or transporting their goods across the portage. This portage makes a head of navigation, ascending the river. It is about two miles in length; and above, to the Dalles [The Dalles, Oregon], is 45 miles of smooth and good navigation. We had to-day an opportunity to complete the sketch of that portion of the river down which we had come by night, and of which I will not give a particular description, which the small scale of our map would not illustrate. Many places occur along the river, where the stumps, or rather portions of the trunks of pine trees, are standing along the shore, and in the water, where they may be seen at a considerable depth below the surface, in the beautifully clear water. These collections of dead trees are called on the Columbia the submerged forest [such as the Submerged Forest at Wind Mountain], and are supposed to have been created by the effects of some convulsion whch formed the cascades [Cascade Locks vicinity], and which, by damming up the river, placed these trees under water and destroyed them. But I venture to presume that the cascades are older than the trees; and as these submerged forests occur at five or six places along the river, I had an opportunity to satisfy myself that they have been formed by immense land slides from the mountains, which here closely shut in the river, and which brought down with them into the river the pines of the mountain. At one place, on the right bank, I remarked a place where a portion of one of these slides seemed to have planted itself, with all the evergreen foliage, and the vegetation of the neighboring hill, directly amidst the falling and yellow leaves of the river trees. It occurred to me that this would have been a beautiful illustration to the eye of a botanist. Following the course of a slide, which was very plainly marked along the mountain, I found that in the interior parts the trees were in their usual erect position; but at the extremity of the slide they were rocked about, and thrown into a confusion of inclinations. About 4 o'clock in the afternoon we passed a sandy bar in the river, whence we had an unexpected view of Mount Hood, bearing directly south by compass [probably Hood River vicinity]. During the day we used oar and sail, and at night had again a delightful camping ground, and a dry place to sleep upon. We made, in the mean time, several excursions in the vicinity [The Dalles, Oregon, preparing for their journey south along the banks the The Deschutes River to Klamath Lake, and onward to California]. Mr. Perkins walked with Mr. Preuss and myself to the heights, about nine miles distant, on the opposite side of the river, whence, in fine weather, an extensive view may be had over the mountains, including seven great peaks of the Cascade Range; but clouds, on this occasion, destroyed the anticipated pleasure, and we obtained bearings only to three that were visible: Mount Regnier [Mount Rainier, Washington, although most likely Fremont was seeing Mount Adams, Washington], St. Helens [Mount St. Helens, Washington], and Mount Hood [Mount Hood, Oregon]. On the heights, about one mile south of the mission [The mission at The Dalles was towards the southwest in today's city], a very fine view may be had of Mount Hood and St. Helens. In order to determine their positions with as much accuracy as possible, the angular distances of the peaks were measured with the sextant, at different fixed points from which they could be seen.